Simultaneous auroral and equatorial electric field data are used along with magnetic field data to study anomalous electric field patterns during disturbed times. During some substorms, accompanied by ring current activity, the worldwide equatorial zonal electric field component reverses from the normal pattern. This is interpreted as a partial closure of high latitude field aligned currents in the dayside, low latitude ionosphere. These currents flow westward across the dayside. In several cases the zonal equatorial electric field component was nearly identical in form to the zonal auroral component, indicating the close electrical coupling between these regions. 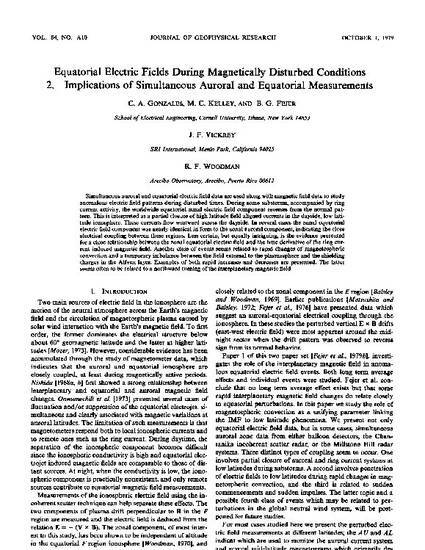 Less certain, but equally intriguing, is the evidence presented for a close relationship between the zonal equatorial electric field and the time derivative of the ring current induced magnetic field. Another class of events seems related to rapid changes of magnetospheric convection and a temporary imbalance between the field external to the plasmasphere and the shielding charges in the Alfven layer. Examples of both rapid increases and decreases are presented. The latter seems often to be related to a northward turning of the interplanetary magnetic field.